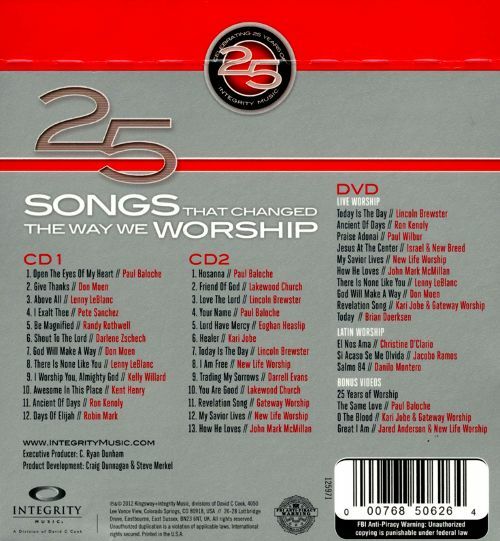 Jay's Musik Blog: Integrity Record's "25 Songs That Changed the Way We Worship" Out Today! Integrity Record's "25 Songs That Changed the Way We Worship" Out Today! 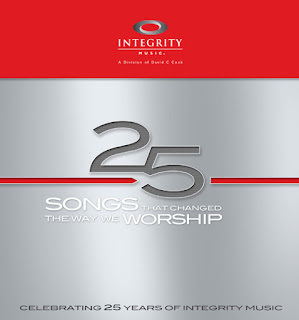 Today, Integrity Records is releasing 25 Songs That Changed the Way We Worship, an album that celebrates twenty-five years of music and ministry for Integrity Records! That’s right – Integrity Records was incorporated in 1987, and since then, many of the songs they have published have become modern-day hymns. Besides the fact that these songs have touched many lives and changed the way we worship (as its title states), they are all chart-topping worship songs that have been covered by many artists over the years. In fact, Integrity’s songs are now translated and sung in over 164 countries! This 2-CD collection of twenty-five songs features many recognizable songs, including Paul Baloche’s “Open the Eyes of My Heart,” Darlene Zschech’s “Shout to the Lord,” Kari Jobe’s “Healer,” John Mark McMillian’s “How He Loves,” and more. 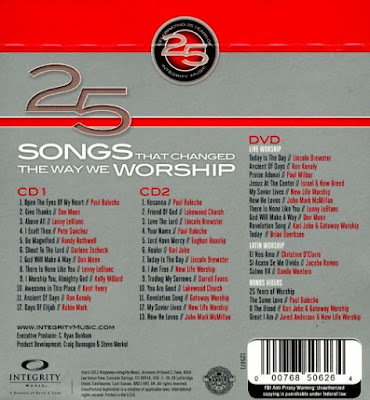 In addition, a DVD featured in the package includes live performances of ten of these songs, not to mention an interview segment where Integrity Records’ leaders and some of their artists share how these twenty-five songs have impacted them. Included in the mix of those interviewed is Leslie Jordan from All Sons and Daughters, Elias Dummer from The City Harmonic, Rita Springer, Glenn Packiam, Israel Houghton, and more! In addition, the album’s packaging (which makes for a great gift) features song stories, original artworks, lyrics, and all the original information on the songs off the album. In addition, to celebrate twenty-five years of music and ministry, Integrity Records is re-releasing five of their classic albums with the original artwork. These albums are Don Moen’s Give Thanks, Ron Kenoly’s Lift Him Up, Hillsong’s Shout to the Lord, Robin Mark’s Revival in Belfast, and Israel and New Breed’s New Season. These albums are available as The Anniversary Bundle for $25 or for $7.99 each. Happy 25th anniversary to Integrity Records, and here’s to many more years of "helping people worldwide experience the manifest presence of God"! Enter to WIN a copy of this new collection, here! Giveaway ends July 2nd, 2012. 4. I Exalt Thee - Pete Sanchez, Jr.